Another of Denver’s great house museums is the Byers-Evans House, known as “Victoria.” William Byers, publisher of the Rocky Mountain News, and his wife, Elizabeth, built the house on the corner of 13th Avenue and Bannock Street in 1883, moving from their elegant mansion on Colfax Avenue and Sherman Street (known as the “Folly” because it was located so distant from the rest of the city). When the Byers were offered $20,000 for the Folly by August Rische, who had struck it rich in Leadville, they built Victoria on an empty parcel of property they already owned next door to the home of their daughter Mollie and her husband, William Robinson. Bill and Elizabeth Byers built their home at 1310 Bannock Street (originally the corner of S. 14th and Olive Streets, before a street name change) in the Italianate style. The two-story house features wide eaves and a flat pitched roof. The architect’s name has been lost to history but the builder appears to have been Hallack and Howard—as evidenced by a letter from William Byers insisting the yard be properly graded so that landscaping could be completed before summer. Built of common brick with red-tile porch floors, the house features a cast-iron widow’s walk. Windows have leaded panes. External features combine a variety of Victorian styles. Classic elements are apparent in the cornices and details of the porch and windows while Baroque, Tudor, and Gothic details accent windows and cast-iron trim. Geometric carvings extend across the full front porch. The tin mansard roof of the porch has Gothic arches and starburst finials. Brick details accent the chimney. An addition was added in 1898 by the Evans family, who purchased the home in 1893. The original house was a modest, middle-class home. Between 1898 and 1912, five additions were made, creating a library, four bedrooms, and two baths and nearly doubling the original size. In 1910, the stairway was relocated so that one of the main floor rooms could be enlarged into a parlor. Today, visitors can find oddly angled walls, a window walk-through, and strange staircases—all evidence of those modifications. Today, the house has been restored to the period between 1912 and 1924. Furnishings are turn-of-the century Evans family originals, for the most part. Wallpapering is brightly patterned and floors are polished wood. Ornate mantles top the fireplaces. Evans family possessions fill the rooms, including a coal range, wedding items, and a wooden canopied bed. William Newton Byers and settled in Denver in 1859 with a wagonload of printing presses. He had no previous experience in the newspaper field but published his first paper within days of arriving (April 23, 1859). Elizabeth had suggested they call the paper The Rocky Mountain News. Bill was born in Ohio in 1831 and raised in Iowa. He was a surveyor by trade and spent time surveying in Washington and Oregon before returning to Iowa in 1854, where he married Elizabeth. An early settler in Omaha, Nebraska, he helped survey that city in 1854 and served on the Omaha City Council and in the Nebraska Territorial Legislature. His surveying business flourished until a financial depression in 1857 hit the business hard. A year later, hearing of the gold in the Rocky Mountains, he decided to begin publication of guide books for gold seekers and to West himself to seek his fortune from providing services to the miners. In 1859, he purchased printing presses from a defunct Nebraska newspaper and moved hauled them by oxcart to Denver. It is said that he pre-wrote many of the stories and simply filled in the details upon his arrival. In his role as newspaperman for the growing city, he promoted it to those in the east, attracting more businesses and settlers to the area. He organized Denver’s Chamber of Commerce and was active in local politics. He was well-liked, powerful, and influential in the new city. An avid outdoorsman, he was a member of the first party to scale Longs Peak (bringing wine to sustain the group) and, at age 70, guided Albert Bierstadt to the summit of Mount Rosalie (now known as Mount Evans). He also owned Hot Sulphur Springs in northern Colorado but was never able to turn it into the tourist attraction he had hoped for. Elizabeth Sumner Byers was also born in Ohio, in 1834, and grew up in Iowa. After marrying Bill, she kept his books and it was she who suggested Bill pursue the newspaper business, borrowing money from her father to buy the presses. She and their two children, Frank and Mollie joined Bill in Denver a few months after his arrival. Their first home was in a tented hotel with no beds. Later they moved into a dirt-floor cabin connected to the newspaper business. After Denver’s first rocky year, thousands poured into new town and Elizabeth organized the first Ladies’ Union Aid Society in 1860 (later the Ladies’ Relief Society, now the United Way) to assist destitute women and children with food and clothing when supplies failed to keep up with demand. She was later instrumental in founding the Denver’s Children’s Home. The Rocky Mountain News survived a flood in 1863 and Bill sold the paper in 1879. Bill and Elizabeth were, by then, leading citizens in the community and, in fact, the state. Bill was active in both business and politics and served two terms as Postmaster of Denver. Elizabeth was known for her leadership and support of culture, education, and social causes. Bill remained active, founding the Colorado Historical Society; working with John Evans and Henry C. Brown on the Denver Tramway Company (1886); helping complete the Denver, Texas, and Fort Worth Railroad (1888); contributing to several books on Colorado history and the mining industry and pursuing horticultural interests. He died on March 1905, at the age of 72. Elizabeth and Bill lost two infant children after moving to Denver. Fire claimed one of their homes, flood another. Through all, they continued to regroup and built their first Denver mansion, the Folly, in the 1875 (it was demolished in later years to make room for a state office building). They lived in Victoria from 1883 until 1889, when they moved to South Denver (on East Cedar between Washington and Pearl Streets, later recorded as 171 Washington). That house was later demolished and the William N. Byers Junior High School built on the site in 1921. They also owned a home in the mountains. Elizabeth founded the first school, library, and Methodist church in Denver. She supported enumerable charities. She was known as a gracious hostess and was a key force in the organization of the Women’s Home Club (later YWCA) and the Women’s Club of Denver. She declined the honor of a stained glass window in the Colorado Capitol building in 1899, saying other women deserved it more and that she felt the window dedicated to Bill was enough honor for the family. She died in 1920. Elizabeth Street in Denver is named for her. In 1889, William Gray Evans, son of former territorial governor John Evans, bought “Victoria” from Bill and Elizabeth Byers. Bill Byers and John Evans were close friends, as were their wives, Elizabeth and Margaret. All four were heavily involved in the development of Denver. 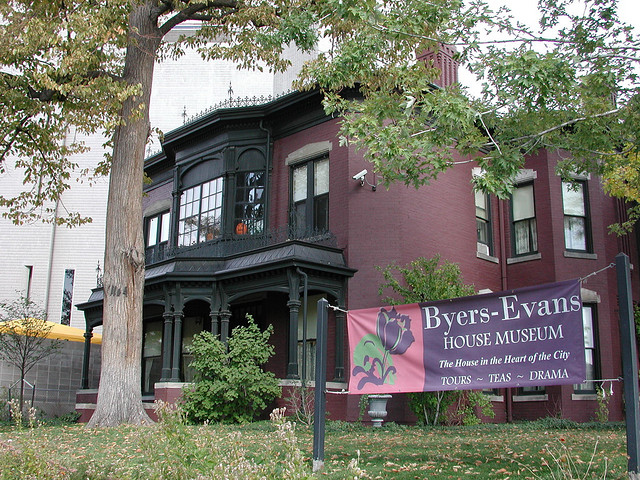 William Evans was president of the Denver Tramway Company and a business associate of Byers. Evans paid $30,000 for the house at 1310 Bannock Street. William Evans was the oldest son of John and Margaret Evans. Born in Evanston, Illinois, in 1855, he moved with the family to Denver when his father was appointed territorial governor. He married Cornelia Hunt Gray in a small chapel his father had built in memory of William’s sister, Josephine Evans Elbert, who had died at age 24. The chapel was located across the street from the Byers home. When Evans purchased the home (located on land Elizabeth Byers had purchased from his father), William and Cornelia had two children, John (age five) and Josephine (age two). Another daughter, Margaret was born a few months after they moved in. Katherine was born five years later. Evans was involved in several businesses. Involved in the construction of four railroads, he organized the Denver Electric & Cable Company, serving first as secretary, then as president of its successor, the Denver Tramway Company, retiring that position in 1913. He also worked with David Moffat to finance the Moffat Tunnel (the 6.2 mile railroad tunnel through the continental divide linked Denver and the Western Slope). Upon Moffat’s death in 1911, Evans became president of the Denver, Northwestern, & Pacific Railway and of the Colorado-Utah Construction Company, working to continue the then-unfinished tunnel project. In addition, Evans became president of the Board of Trustees of the University of Denver in 1902 and was close friends with Denver mayor Robert W. Speer. Though never active in politics himself, Evans was recognized as a powerful man behind the scenes. He was instrumental in the adoption of the proposal which established the Denver park system in 1894. Though a financial depression delayed actual creation of the parks, the recreational areas were eventually pursued under Mayor Speer’s term of office. Among his visions for the park system was the Civic Center complex, which he pursued throughout his lifetime. Evans died in 1924. The home on Bannock Street was shaded by trees and flagstone sidewalks served the residents. The street itself remained unpaved until 1892. When William’s father died in 1897, he extended an invitation to his mother and sister to join the family on Bannock Street. An addition was built to accommodate them, as well as their maid. The two-story wing was constructed on the side of the house, facing Thirteenth Street. The first floor was furnished with items Margaret Evans brought from her life with John; the Governor’s bookcases and their contents were placed in the library. Bedrooms for Margaret, Anne, and the maid, Bridget, were located on the second floor along with a small altar Margaret used for her daily devotions. Governor John Evans had left an estate to the family, which became the Evans Investment Company, headed by Margaret, her three children, and her daughter in law. Around the same time, William transferred ownership of “Victoria” to his wife, Cornelia. Cornelia’s father, Captain William P. Gray, also moved in with the family. (Captain Gray and Margaret Evans were siblings). Many of the nautical instruments preserved in the home belonged to him. William and Cornelia’s son John married Gladys Cheesman in 1908. Daughter Margaret, a pianist, moved to Paris to pursue music (she married Roblin H. Davis upon her return after World War I). Her sister, Josephine, spent a year there as well, studying art. Youngest daughter Katharine attended Miss Reed’s school. Cornelia nursed both her father and her mother-in-law through the illnesses that took their lives. Though busy, Cornelia (Neanie) maintained a rose garden and supported her husband’s interests. Two servants and a chauffeur attended the family. Katharine remained in the family home with her parents and her Aunt Anne. Over the years, changes were made to “Victoria.” Interior walls were removed to enlarge the living room and a music room created for Margaret’s piano. The alterations also changed the stairway. Additions toward the rear added a dining room next to the kitchen to serve the help, pantry space and a laundry room. The carriage house was altered to accommodate automobiles. Leaded glass windows were added in the new living room and in one of the bedrooms. Anne Evans (William’s sister) was active in Denver cultural activities. She and other family members were involved in development of the Denver park system, carrying out her father’s dreams for the city. She was co-founder of the Denver Art Museum and tirelessly promoted the Civic Center Complex. She was 16 years younger than her brother and had been schooled in Europe. She was a member of the Denver Artist’s Club, heavily involved with the Denver Public Library in developing its collections, reviewed Denver Planning Commission proposals for public parks and monuments, and was well-known for her philanthropic activities. Anne died in 1941. Upon Anne’s death, ownership of the house transferred to Katharine and Josephine, then to John and Margaret. “Victoria” was designated a Denver Historic Landmark in 1976 and is listed on the National Register of Historic Places. Upon John’s death, Margaret gifted the house to the Colorado Historical Society. It is preserved much as it was during the lifetime of William Evans.